SOLUTION: 3-2-1 Agriculture – a free, mobile agricultural information service developed by experts and distributed by telecom providers. 321 Agriculture is a free, mobile agricultural information service developed by experts and distributed by telecom providers. 321 aims to design, create, user-test and optimize voice-based localized advisories. VOTO provides the hardware/software to serve calls, and collects data on user engagement. Customized content is reviewed by sector experts, relying on several datasets and user telephonic surveys. 321 addresses the informal value chain: smallholder farmers, agriculturalcoo peratives, and input suppliers. 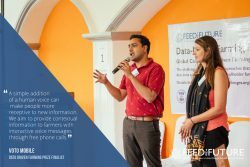 Users of the service will realize the benefits of increased access to information through improved agricultural productivity, ultimately reducing poverty and food insecurity in Nepal.